Antiques experts travel the UK searching for treasures. Mark Stacey and Catherine Southon start their last leg in Rait in Perth before heading to auction in Edinburgh. Browse content similar to Episode 25. Check below for episodes and series from the same categories and more! I am on fire! Yes! Oh, come on, I've got to get to another shop! -You've loved it, haven't you? Of course, I have loved it! Like a married couple, aren't we? -We're like an old married couple. -Speak for yourself with the old! When I get back, I'm filing for divorce. Do you need the number of a good lawyer? she still has a fear of large numbers. for over 20 years, has lost none of his charm. They're a bit like me and Catherine, aren't they, couple of old deers? I hate it when you're all smiley-smiley to me. Our pair began their journey with £200 each. to leave it all to play for today. -I'm nipping at your heels again. -I am poised to strike. of £306.52 to spend today. with a tidy sum of £291.02. our experts opted for this racing green, 1968 one. to finish at an auction finale in the stunning city of Edinburgh. in the Scottish capital of Edinburgh. neck and neck in this trip. one canny buy could make all the difference. Oh gosh, this looks interesting, Catherine. This looks posh and expensive. -It does, but it looks like there's quite a big place. Mark is trying his luck across the courtyard in The Old Sawmill. -Welcome to The Old Sawmill. but mainly Oriental, by the looks of it. I love these Satsuma colours and covers. so, from around 1868 to about 1912.
they're towards the end of that period. I have not been that successful, really, have I? Ha! Well, maybe just a little outside your budget, Mark. I wanted to have a little look at this. Those exotic cranes? I think so. Priced at a very reasonable £25, that's one to think about, Mark. dare I ask what's happening with your dog challenge? when you bought a pig! Yes! Hold on, that's not on! -Look at that, I couldn't find a dog. There are no rules, Catherine! I'm not going to mention it, unless she mentions it. Is that fair? I think so. I had hoped it had gone away, to be honest. But what's this Catherine has in her hand? It's a lovely little wall plaque. Ivory is not to everyone's taste but the fact is that it predates 1947, meaning it's perfectly legal. and I'm beginning to fear the worst. Cos if I bought that, would that count as my doggie purchase? Cos it's got a dog in it, hasn't it? So, that would be all right, wouldn't it? and buying a dog-related item. Not like Mark. Still not forgiven him, eh? it's time to ask Heather the all-important question. Go on, take a gamble. 55. Shall we both do it? Shall we? -You're costing me a fortune. -Oh, I'm not. Shall we? 55? -Go on, seeing it's you. -Cor, Catherine's quick off the mark. Her first deal done and already she's sorted out her challenge item. Meanwhile, Mark's turning Japanese again at Old Timers Antiques. This is bamboo actually, I think. Carved bamboo, so it's going to be Oriental. But look at this wonderful carving here. But what makes it really interesting is it's got a little signature here. -And would you like to know what it is? -So would I, cos I haven't got the faintest idea! Maybe you could get David in to find out more about it, like the price. How much is it? Do you know? and he has said that his very best price is £40, I'm afraid. nearby Catherine's ready to spend, spend, spend. -This time at Carse Antiques. -I like that. Bit of pokerwork. It's a candle box, essentially. So, you put all your candles in there, funnily enough. This design on here is all done by hot pokers. I love the design on this. This is really nice. but the ticket price is a very real £60. Let's get dealer Alasdair involved. -I think I should have that at 30. -I think you've got a chance with that. That's the way to do it, Catherine. Two items down. Now, has Mark worked himself up to buy the cane yet? -So, 40 is the final? -I think it has to be. -I'll shake your hand on that. -Thanks very much. That's £40 for you. can Mark find some wiggle room on the shoehorn he looked at earlier? -What's the best price I can have on that? -I've got it on at 25. We're very close. Could we possibly do it for 15? -OK, seeing as it's you. Well done, Mark. The master haggler is back in business. Catherine's going to buy something else from Alasdair. -Just like a little snuff. -Nice to have the heart. -That's nice. That's what I thought. -Can you do a bit better on that, Alasdair? -Do you want me to give it to you? -It's wonderful! Keep doing it! -We're doing well, aren't we? -Please may we say 25? And then I won't do any more. -What did I start at? -I don't know. But we won't worry about that. -No, you're not, you're nice. You're not the first to fall for a bit of Southon charm. Both our experts are clearly on a mission. First stop of the morning and they've already amassed five items between them. where Mark's dropping Catherine off for some more shopping. Now, I don't know about you but I'm getting a sense of deja vu here. -I remember seeing you before. -Mark's been here, hasn't he? -Only a few days ago, I do believe. and the doggy decanters he bought from Derek. And it looks like Catherine has found something equally quirky. That is Jonah of Whales. He's wonderful. I don't think he's very old, is he? -I don't think it is, no. You haven't seen one before, have you? No, I haven't seen one before. I feel I've got to buy that. How much is it? My gosh! It looks as if she's a hit with the men today. -I'm going to have the whale. -And I'm going to give you £15 for it. Oh, gosh! Right. That's very kind! I was actually pulling your leg but that's fine. I'll shake on that before you change your mind! 14! That's fabulous! Crikey! She's done it again. There's no messing about with her. making his way along the coast to Arbroath. 36-0 against poor old Aberdeen Bon Accord. But it's not fish or football that Mark is here for. country houses in the nation. -Mark, nice to see you. Welcome to Hospitalfield. Thank you. It is a lovely house, isn't it? -Tremendous monument to 19th century skills. -What are we going to see first? from the nearby Arbroath Abbey as a leprosy and plague hospice. and married a local artist, Patrick Allan. This triple portrait really dominates the room, doesn't it? -In the middle? How cosy! -..and Elizabeth, his wife, on the right. -of Hospitalfield to illustrate a book by Sir Walter Scott. And Elizabeth might have been there at that time and so things develop. painted by Patrick for Scott's book The Antiquary. and used it as his model for Monkbarns in the novel. he went on to become president of the British Academy Of Art in Rome. This is the original studio. and where he was very active, as you have seen by the paintings in Hospitalfield House. further art in various forms, which is what Patrick wanted when he died. for the promotion of education in the arts in 1890. -trained here at Hospitalfield and fully looked after. So it really spawned a legacy. and growing stronger, I think. working within the broad themes of contemporary art and design. Joan Eardley and Peter Howson. Graham, thank you so much for your time. and I hope one day to come back again and have a closer look. It has been a pleasure to have you, Mark. Thank you for coming. in the cultural landscape of Scotland. before they get some shut eye. And as they say in these parts, "Nichty nicht!" to appreciate a marvel of engineering. Look at the bridge, Mark! Look at the Forth Bridge! That is a fantastic piece of engineering, isn't it? It's a wonderful piece of engineering. I've already said that, thank you. is expected to last at least 25 years. the bridge had the longest cantilever span in the world. But how far have these two stretched their purse strings on this leg? his Japanese themed shoehorn and walking cane. That means he has £236.02 left in his coffers. which still leaves her with £182.52 to part with. to the stunning city of Edinburgh. I love Edinburgh. It's such a wonderful city. -It's quite a colourful city. -It's a very colourful city. as the second most popular tourist destination in the UK. to take to the auction finale. just off the famous Royal Mile. He looks a bit of a boar! Ha! I suppose bonbon dishes. They're modelled as... Not sure, really. They're some kind of fruit with a stalk handle. used for serving or displaying confectionery. but aren't the only things that have impressed Mark. more things in this shop than I have in a huge antiques centre yesterday. -How bizarre and ironic is that? you're bound to find a dog purchase in here then. I was informed by Her Serene Highness last night. I think she's bought something. So I've got to find a dog. What's that they say about dogs resembling their owners again? I think he's quite fun. They are collectable, aren't they, soft toys? I think that might be my poochy purchase. Again, with the original dust. Could have hoovered him off! Maybe Tony can knock off a few notes from its £12 ticket price. And don't forget those bonbon dishes, Mark. -They can be 20, those two. I think that's reasonable enough. -Can I make you a really sneaky offer on that? -Just as a bit of fun. Can he be a fiver? -He can, yeah. That's good. -Oh, hello! Even the dog's surprised at that price! Thank you so much, Tony. That's wonderful. I'm really pleased with that. Thanks very much, Tony. So, a great bit of business, Mark. Now, where's Catherine got to? The University of Edinburgh is one of the highest rated in the world. -Hi, there. Hi. I'm Catherine. -This is wonderful. Where are we? one of the most translated authors in the world. I'm very excited about this. Lead the way. Kidnapped and The Strange Case Of Dr Jekyll And Mr Hyde. but in his teenage years decided Louis was far more stylish. and had his first book published at just 16 years of age. including this cupboard with a macabre tale behind it. One of the star exhibits in this room is this cabinet. and it was made by the notorious Deacon Brodie. and city councillor by day, socialising with the gentry of Edinburgh. for building cabinets and repairing...mending locks. I can see a story coming out of that. his life of gambling and to pay for his family and his mistresses. Do you think that was the influence for Jekyll And Hyde? of good and evil and dual personalities. including Jekyll And Hyde, in the 1880s. which has been adapted over 50 times for movies and television shows. travelled to Mediterranean climes to alleviate his symptoms. to spend his last years in the Pacific islands of Samoa. They built a house, Vailima, on the Samoan island of Upolu. it was quite unusual for somebody to just travel to the South Pacific. -But I'd love to see some of the items. are associated with his time in the South Seas. Here we have Stevenson's own riding boots. They're in pretty good condition. Did he do a lot of riding? He rode on Samoa, yes. spread to the locals, who regularly consulted him for advice. This ring here is very special. which means teller of tales, storyteller. -That's what they called him? That was his nickname? And a Samoan chief had this ring made for him. -And presented that to him. when he had his fatal collapse. In fact, we have a picture of his tomb over here. On his tomb are inscribed the last three lines of his poem, Requiem. That's quite poignant, isn't it? so much more about Robert Louis Stevenson. Thank you very much indeed for having me. Thank you for visiting the Writers' Museum. It's time for our little bookworm to carry on with her shopping. Talking of which, what's old Stacey up to? No good, I fancy. This little find is a traditional teahouse and antiques store in one. I rather like this Victorian cruet set. containers for the mustard, the salt and the vinegar et cetera. but priced at £175, maybe you should have a think about those. Oi! There's precious little time for a cake and a cuppa. Cedric in his pursuit of the pretty cruet set. -because I think this is my favourite piece. It's my last shop of the entire series, it's my last auction. and I think this would round it off. -Could I be very mean with you? -I would love to buy it for £80. -I knew you would say that. Shall we shake hands on 85? And I'm going to try your tea. -I'm glad you're enjoying it. Now I'm going to put on weight and have that lovely scone. while we catch up with Catherine who is meeting a well-known face. It's George Pirie who we met earlier in the trip, up in Tarland. -Something small and beautiful and unusual. -And what else? No pressure. And what the lady wants the lady shall get. I'm a bit concerned you think I've got more money than I have. so he's taking our Catherine behind the scenes. You are 200 feet below Edinburgh here. I am not sure I want to go down here. The lengths she'll go to to beat Mark. -like this 19th-century Chinese plate priced at £120. You are quite good with Oriental stuff, I happen to know. I'm not good at Oriental. ..and I was very lucky with it, but it was chancy. I didn't like it at all. I don't know if my nerves can take chance any more. -I'm this close to Mark. I cannot let him win. Well, this is the piece that is going to get you there. There's huge profit in this piece. That all depends on the price, doesn't it, George? -..I'll give you it for a straight oner. This piece could decide the entire road trip. be on the telephone to me asking me out for a glass of champagne. -That's how sure I am you're going to do well with that. -90 quid and I'll shake your hand. -You've got a deal. There you go. Wow, that's a bold promise, George. But what a finish to our road trip. so it's time to meet up with Mark as they reveal all to each other. I do feel quite emotional actually. -Go on. Show me what you've got. -Oh! Right. So we've gone back to the dog. -Yes, when you fondle it. And I love this. Solid silver, Victorian. -That was my most expensive purchase. -Was it something like £60? -But don't you think it's a nice selection? -It is a nice selection. -I wouldn't expect anything else from you. -You can, and you will be as nasty as you always are. -OK, at least say something! I'm looking, because I like the late Chinese dish with the dragons on it. That's rather nice. I love that border. -Mmm, it's a nice border, isn't it? I'm shaking, because I spent a lot of money on that. A huge amount. -What's a lot of money? -I got told to buy it. -I love him. I think he's lovely. -It's brand-new, but I love it. -It's probably got about 20 years age to it or something. Is that a tongue in your cheek, Mark? -And you've bought a little doggie. I love him. And a little horn snuff box? Yes, and I bought that purely because of the heart. -Oh, was that because of me? -but I actually rather like your selection. Well, I wish you lots of luck at the last auction. -And I equally wish you lots of luck. Well done, dear. Oh, my God, Catherine, you are silly! Well, let's find out what these silly sausages really think. He may be a little bit worried about my lovely Oriental dish. It all hinges, for Catherine, I feel, on the Kangxi-style dish. It is well painted. I like the pattern. Chinese items are still hot at the moment. I'm hoping that the Chinese market in Edinburgh is going to be realistic. in the Edinburgh district of Leith. It's raining on our parade, and it's our last auction. -The weather's really closed in on us, hasn't it? -I know. Is this an omen? -Is it all going to end in tears? a thriving auction house that's been in business since 2003. -This is not quite what I was expecting. Is it actually on today? It doesn't seem like there's anyone around! It's just us! Are we early, or late? Don't worry, everyone's waiting for you inside. I like the little snuff box. but it's a lovely little snuff box. come up in that sort of format. They're usually much more cut off on the base. is the little carved ivory panel. Maybe ten, 15 years ago, it would have sold much better. The market for that type of thing is slightly flat at the moment. and splashed out £165 of that on his five lots. and parted with £214 on her five lots. the difference between winning or losing the road trip. You blend in very nicely with the surroundings. There's a couple of carpets around. Yes, I knew there was something coming! Huh! Looks like the red carpet treatment for you, Mark! Ha! The last auction has started, Catherine. the 19th-century Chinese plate, painted with a dragon and phoenix. -Oh, my stomach's going over now. I'm getting nervous. -40 to start it. 30. -30 I'm bid. £30 I am bid for the Chinese plate. At 35. Five. 50. Five. 60. Five. At 65 on my right now. Oh, no, no, keep going! At 65. Keep going. -And there's a phone bid coming in. -Oh, there's a phone bid! -Oh, I thought it was going to sell for 40 there. At 190. Standing in the room now, on my right, at 190. -And I'm selling at last call. -You've made £100 on that. It took a while to get going, but a fantastic profit to start with. -So I'll just go along for the ride. -Oh, Mark, don't make me feel bad! -candle box, decorated with mythical beasts? -20 to start it. 20 I'm bid for the candle box. -I thought it would make a bit more than that. Still the lady's bid in the back. At £40 for the candle box. -You got a profit out of it, Catherine. -I think you should be pleased with that, actually. any of his lots shown. Here's your chance, Mark. Your first item. The Japanese shoehorn. 30. 20 for this. 20 I'm bid. 20 I'm bid for this lot. 25. 30. Five. 35 here. -At 35. Last call. 40. -Very good. That's very good. -Well done. That's a good profit. -I'm happy with that, that's £30 profit. This is a promising start. It's knowing what to pay, Catherine. Now, staying in Japan, it's Mark's walking cane up next. -20 for that. Ten to start it. -The cane. Ten I'm bid. -Don't worry, it will carry on. 18. 20. 18 here. 18 here. 20. 22. -It's got a long way to go. On the right at 28. Last call. At 28. 71. -No, I really don't believe that. -Someone got a real bargain there. Sometimes the right bidder is just not in the room, Mark. Bad luck. Let's see if Catherine's next lot will snuff out Mark's chances. Ha! 20 for it. Ten to start it. Ten I'm bid. 12. 14. 16. 18. 20. Two. 24. 26. Lady's bid now at 28. 28 at the back. At £28, in the back. -You got your money back. Wiped your face. that will be a loss, I'm afraid, Catherine. Well, you can just sit back on your huge profit, now. -I can, actually, can't I? -You don't have to worry about a thing, do you? No. You can do all the worrying for me! should you be worried about your dog challenge item? A German oak wall plaque featuring a hunting dog. 30 for this to start it quickly. 30 I'm bid. £30 I'm bid. 35. 40. -At £40. At £40. Nobody else now? Last call at £40. -Well, you win some, you lose some. -She may well be, Mark. But you can win the last dog challenge with your 1950s poodle! -It is cute, isn't it? And it squeaks. -But will I squeak a profit out of it? -30. 20 for it. 20 I'm bid. -On commission at £20 for the poodle. 25. 30. Five. 40. At £40. Last call at 40.
that's the end of the poochy purchase bit. When it comes to the dog challenge, Mark's been crowned Best In Show! -I wish I'd bought four poodles, now! But it's winning the road trip that Mark really wants. -Can his silver bonbon dishes get him back into contention? -30 for them. 30 I'm bid. -Oh, well that's a profit. £30 I'm bid. 35. 40. Five. 50. At £50. At £50. The little bonbons at £50. Nobody else now going on. Another good profit for Mark. This is getting close! profit on his Victorian cruet set? This is my last lot of the sale. 80. 60 for this. 60 I'm bid. £60 I'm bid for the cruet set. 65. 70. Five. -80. Five. At 85. At £85. -90. That's what I paid. Very interesting. That's brought our experts almost neck and neck. But Catherine's still got her last item to go. that will see her win the road trip. Have they got a sense of humour here, though? Well, I think so, Catherine. They bought the poodle. Swings backwards and forwards and his mouth opens. -30. 20 for this to start it. 20 I'm bid. -Oh, yes! There we are. Five. 40. At £40. 45. 50. New bid. You see, I told you that would fly. -You see, I said that would fly, because it's fun. After a wonderful trip, Catherine goes out on a whale of a profit. Ha! -Oh, thank you. You can buy me a drink. -No, you can buy the drinks! Mark has been pipped at the post. and battled valiantly to a profit of £50.66 after auction costs. And so ends the trip with £341.68. Don't look so glum! earning a fantastic £71.36 profit after auction costs. but also the winner of this week's road trip. She's finished with a grand total of £377.88, so well done, Catherine! -All profits, of course, go to Children In Need. -It's all over. And well done. And what a trip it's been for our two. This is actually one of the most spectacular places I've ever been to. -Onward and downward, as they say! -Hold on! That's not on! -I was waiting for you. -Now, come on, I've got to get to another shop! -Right, you don't have to be so bossy! -I'm just pointing it out. -You don't need to, because I can see. As they say in Scotland, "Cheerio the noo"! I'm going through this sort of buying crisis. 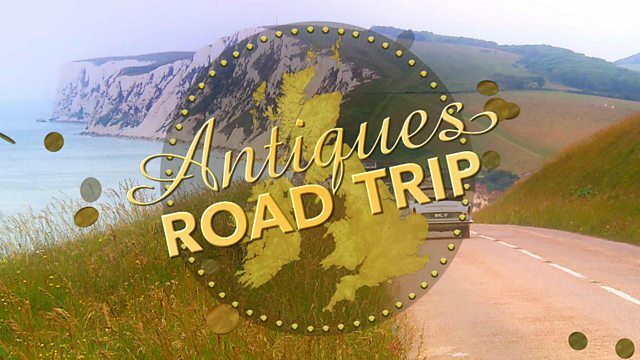 On the final day of their Scottish road trip Mark Stacey and Catherine Southon start in Rait in Perth and Kinross then travel through Dundee and Arbroath before heading to auction in Edinburgh.